Fishing for largemouth bass is a sport enjoyed by tens of thousands of people throughout the world. For some, this isn’t just a hobby but a way of life. People who enjoy bass fishing to the point where they earn their living doing so have countless amounts of knowledge, tips, and tricks to pass on to the novice fishermen. These men and women are out on the lake at least eight hours per day, just as any other job requires, and some are out there from dawn until dusk. Fishing for largemouth bass is not like fishing for other freshwater fish. There is much skill that is involved in largemouth bass fishing, such as knowing what lure to use and when to use them. 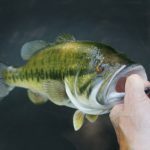 Unlike other forms of fishing, largemouth bass fisherman do not use worms that are gathered in a can before they go out. Largemouth fishermen use plastic or rubber worms that are sometimes called finesse worms. The reason that they are given this name is because one must learn how to work the worm in the water before he or she will be successful at catching a largemouth bass. The bigger largemouth bass are very finicky on what types of bait they will attack, and when they will attack them. Bass fishermen usually have a large arsenal of rubber worms in their tackle box to choose from. Serious bass fishermen will have rods already rigged up with different worms so they can simply switch rods instead of taking the time to tie on other baits. Plastic or rubber worms are one of the most effective tools used to catch largemouth bass, and they come in many different shapes and sizes. You can even purchase rubber worms that are garlic flavored. A very popular lure that is used in early morning or late evening just before sundown is the top water lure. These lures are probably the most interesting of all lures simply based on the fact that you can see them sliding along the top of the water. Attached to certain kinds of top water lures are chatter boxes, that emit a unique sound when traveling on top of the water. These chatter boxes will attract largemouth bass, which will sometimes strike the lure when it is presented properly. There are also lures called top water poppers. Top water poppers are lures that resemble bait fish that largemouth bass feed on. These lures can be very effective when maneuvered correctly. Many top water poppers will dart from side to side when worked correctly, which resembles a bait fish that is out of their element. A diving lure is a lure that resembles a bait fish or minnow that dives deep into water where the larger bass are lurking. These lures usually feature a larger minnow style body with a large head and a short, tapered body. The minnow also has a large lip attached just below the swivel that is used when tying the lure to your line. This lip, or tongue, is what gives the lure the diving action. When you jerk, or pull forward on the lure, the lip is tapered downward, which provides forward resistance to the lure and dives toward the bottom. These types of lures come in many different varieties and are usually only used by those who understand more than just the basics of largemouth bass fishing. Other lures that are often used for largemouth bass fishing are small, plastic frogs and crayfish. The frogs usually feature legs that move similarly to the action of a live frog, and those who know how to present this bait can make them look just like a swimming frog to a bass swimming deep. Crayfish are basically the same although they generally have a lip that allows them to dive similar to deep water divers.